Train passengers will soon be able to buy tickets on their mobile phone. 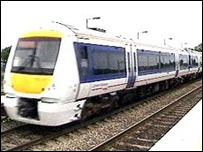 Chiltern Railways, which operates from London through Buckinghamshire and Oxfordshire to the West Midlands, plans to deliver tickets to mobile phones. The new technology sends a barcode to a mobile phone via a text message, which passengers can then scan at the station ticket barrier. Its hoped the method will make buying tickets easier for passengers and help reduce queues at stations. Neil Micklethwaite, commercial director for Chiltern Railways, said: "Mobile ticketing will mean easy purchases, anywhere, any time. "The pilot we are launching will be for our popular Eday ticket priced from £5 each. "There are many benefits to mobile ticketing but the most important to mention is that it's simple and convenient." The company said mobile ticketing will be available before the end of the year for a three-month period with the intention of the scheme becoming permanent. Tyne and Wear Metro operator Nexus trialled a similar scheme earlier this year and tickets are already available on the mobile phone in Helsinki, Finland.